New IMC and IRC tables show an equivalent length for 10" radius smooth elbows that match the Dryer-Ell's actual length. Unlike sectioned elbows, the Dryer-Ell allows use of the full code-allowable length of run. 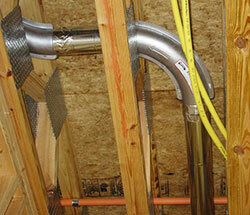 Generally, building code requires a reduction in duct length for all other dryer elbows. 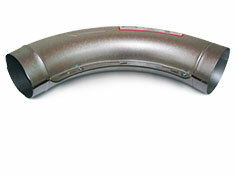 The Dryer-Ell is engineered for a one-to-one ratio with standard straight pipe. With two sectioned elbows instead of the Dryer-Ells shown, this run would have been counted about ten feet longer than its actual length. The Dryer-Ell was specifically designed to minimize airflow friction loss. You may learn more about the design methodology under the ASHRAE Calculations subsection of Product Detail / White Papers. Current building code from the International Code Council now also includes tables (IMC 504.6.4.1 and IRC M1502.4.4.1) that delineate an equivalent length for the Dryer-Ell that is the same as its actual length. The bottom line: Dryer-Ells measure a one to one ratio with straight pipe.